I may be a little biased, but Chattanooga is one of the prettiest cities I’ve ever lived in. We don’t call it the Scenic City for nothing. With a name like that, you can probably imagine how many beautiful and perfectly Instagrammable photo spots there are in Chattanooga. Just browse through all the #chattanooga hashtags on Instagram, and you’ll see what I mean. One of my favorite ways to explore a city—whether I’m visiting for the first time or the tenth time, or I already live there—is to seek out the best photo spots. It’s an excuse to get out, and it gets you a ton of awesome photos to post on social media. That’s what it’s all about, anyway—do it for the ‘Gram, right? 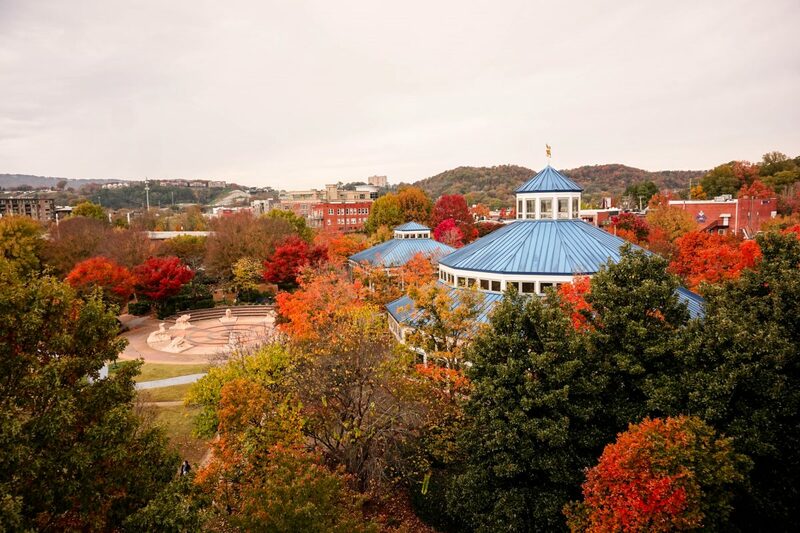 If you’re planning a trip to Chattanooga anytime soon—as you definitely should—make sure you don’t miss these wonderfully Instagrammable (and just plain lovely) sights in our city. If you already live here, you can back me up on how much fun these spots are for photos. Here are some of my favorite photo spots in Chattanooga. Coolidge Park. Lots of green space, some fun fountains, pretty plants, and a carousel. 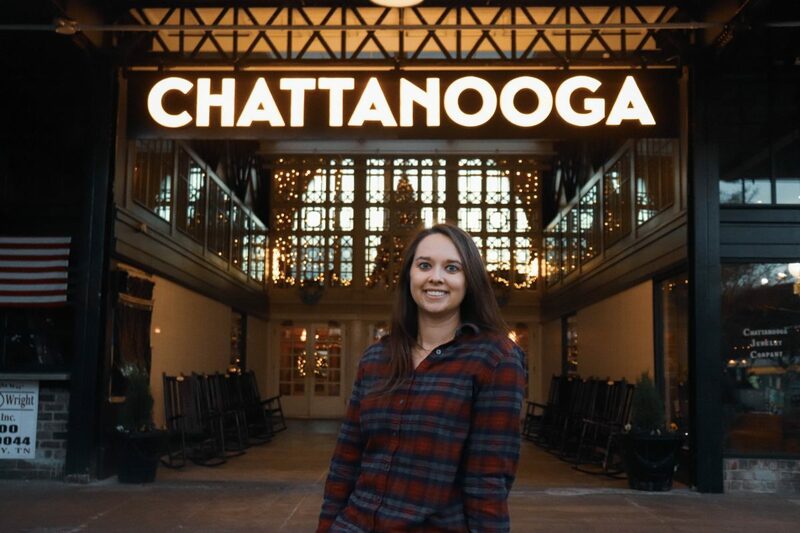 This is a great location for some family photos, and offers the Walnut Street and Market Street bridges, and the iconic Tennessee Aquarium as a backdrop. Renaissance Park. Ditto on the green space, and some great views of the Tennessee River and downtown Chattanooga. It’s conveniently right next door to Coolidge Park, just on the opposite side of the Market Street Bridge. I especially love these first two spots in the fall, when the leaves are all different colors. Walnut Street Bridge. It’s one of the longest pedestrian bridges in the world, and makes for some really great photos. I personally love getting photos with the Hunter Museum of American Art in the background, or looking straight down the bridge to the other side. Hunter Museum. It’s a Chattanooga icon and one of the most photogenic places in the city. The balcony on the main level overlooks the Walnut Street Bridge and the Tennessee River, and on a sunny, clear day, it’s one of the best views in the city. The roof on the back isn’t too bad, either. 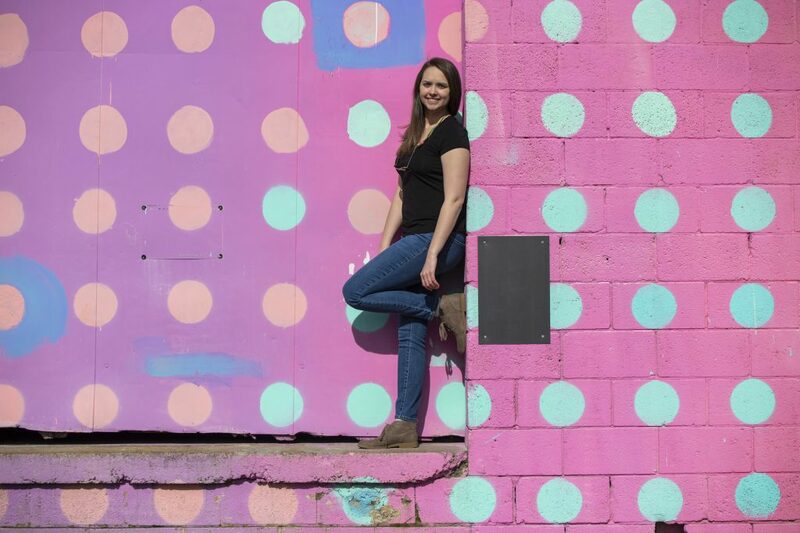 Rainbow dot wall. It took me forever to figure out where this spot is (it’s in the side street between West Main and Williams Street, by the way), but once I found it, I’ve wanted to take a thousand photos there. And I’m about halfway there. It has a wide range of colors so you can get a photo in just about any “mood” or vibe you want. Bluff View art district. Technically the Hunter is included in this, but there are some other really cute photo spots on the bluff, like the patio at Rembrandt’s and the little bridge that connects Bluff View to Riverfront Parkway. It’s especially pretty when the flowers and plants are in bloom. 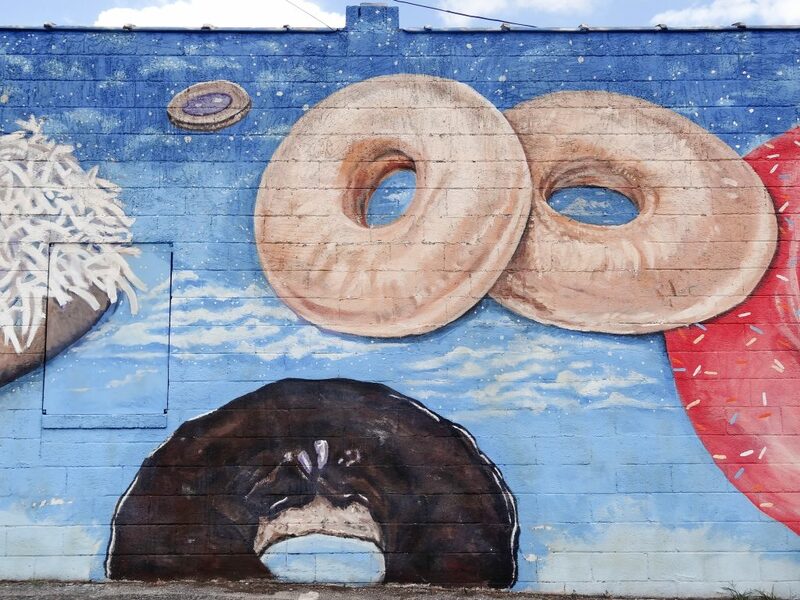 Donut wall. You’ve probably driven by it more times than you can count and just didn’t quite recognize it. 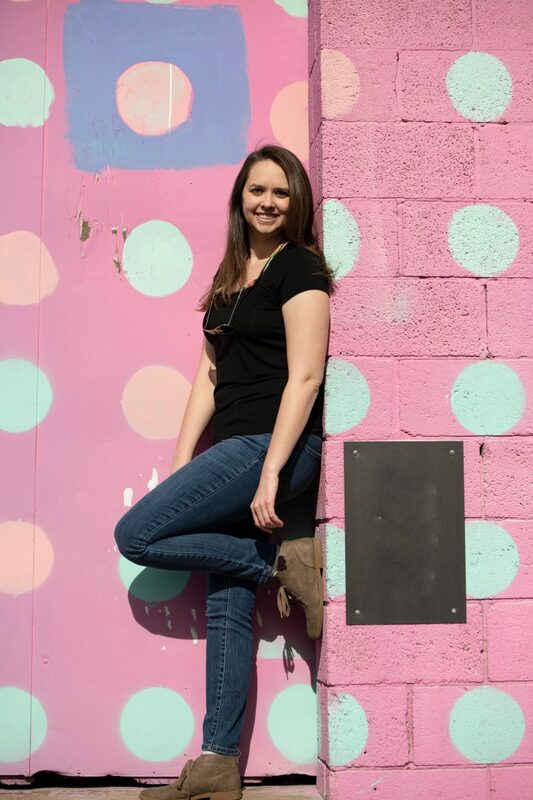 I say that because I totally did, and then one day, I finally noticed it and was like, “Wait, I need a picture in front of that ASAP.” It’s a fun, quirky little spot on Broad Street (by Koch’s Bakery, no less) and makes for great photos. Ross’s Landing. It’s the spot of the original trading post that marked the city of Chattanooga on the banks of the Tennessee River, back in the 18th century. Now it’s the location of some of the city’s best events and easy access to the Aquarium, art district, the Walking Bridge, and some good eats. Northshore alleys. They’re often decorated with chalk art, but it only adds to their charm. I especially love the chalk alleys around the holidays, because they’re covered in Frosty, the Grinch, Santa, and trees. Point Park. Head up Lookout Mountain for one of the best views in the city, and some killer photos. The same goes for Sunset Rock, if you can time it just right. Chattanooga Choo Choo. The gardens are beautiful. The train itself is a piece of history. The inside is stunning, even down to the bathrooms. Have you seen this place decorated at Christmas? It’s magical, inside and out. Urban alleys (downtown). 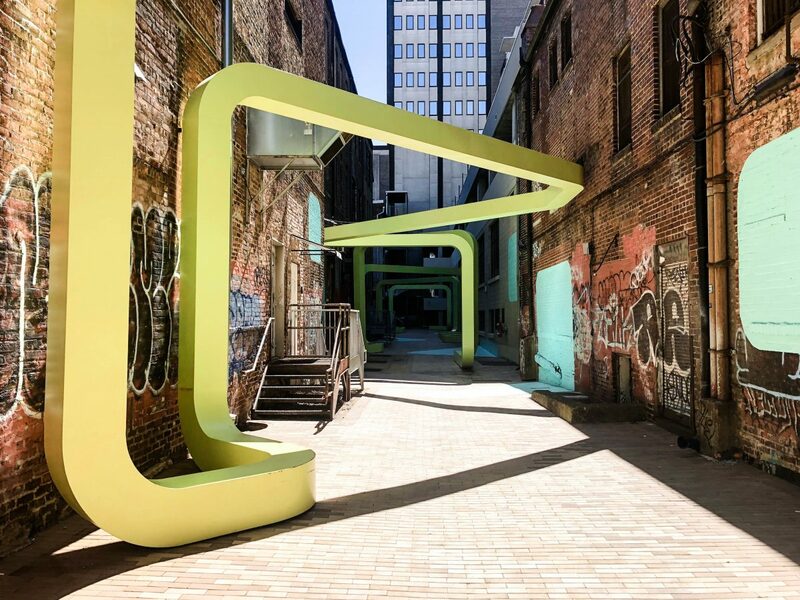 A few years ago, River City Company decided to turn some of the empty urban alleyways into public art exhibits and experiences. The first installments launched in August 2016, and the newest alleyway on Cherry Street opened this past fall. I’ve already done one photo session there, and I can’t wait to do another. Pizza mural on Main Street. 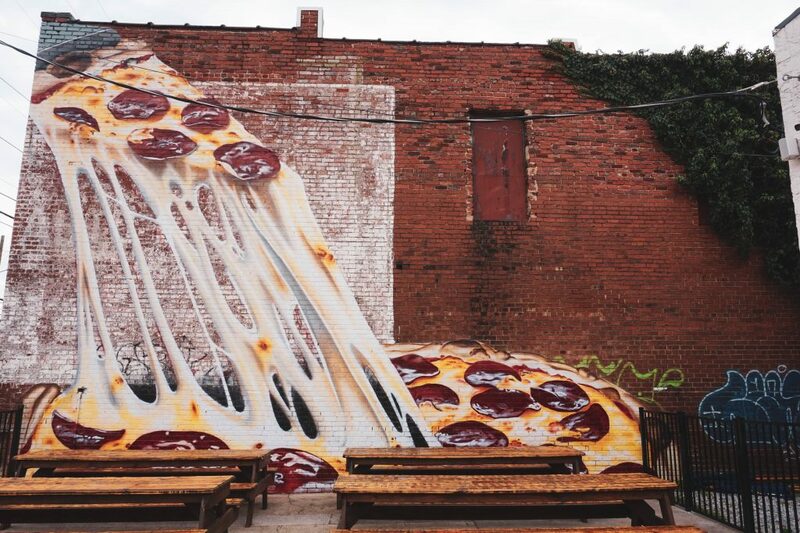 Who wouldn’t want to take a quirky photo in front of a giant mural of melting, cheesy pizza? Southside Pizza is pretty good, to boot. So grab a slice or two and take some fun photos. Any number of restaurants, coffee shops, etc. So many eateries in Chattanooga have some really cool art on the inside and outside, or just really fun spaces inside. Some of my favorites include Mean Mug Southside, Wildflower Tea Shop, Frothy Monkey, Clumpies Ice Cream (all three locations), London Calling, and the Flying Squirrel. What’s your favorite place to take photos in your city?